Judy Thompson, the artist for the cover of the book Pioneer Girl, The Annotated Autobiography of Laura Ingalls Wilder, will be the artist and instructor of an upcoming workshop entitled "Badlands Watercolor Workshop". The workshop is going to be held at the Circle View Guest Ranch, just outside Interior, SD on April 20, 2016. For more information go to www.judythompsonwatercolors.com. Judy Thompson has received national and international recognition for her Heartland images. She has been selected as Artist-in-Residence at the Homestead National Monument and Badlands National Park. Her Homestead Series has toured throughout the Midwest to celebrate the 150th anniversary of the Homestead Act. 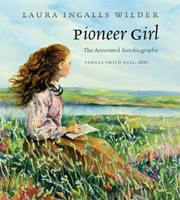 Judy's art also graces the book cover of Pioneer Girl, the Annotated Autobiography of Laura Ingalls Wilder, a national best seller. Judy is a popular teacher and instructor for both children and adults and is approved by the Nebraska and South Dakota Art Councils as an Artist-in-Schools/Communities. Her work can be found in private and corporate collections throughout the U.S. She is a signature member of the Iowa Watercolor Society and is represented at Prairie Edge in Rapid City, SD and Summerwind in Okoboji, IA.